NETWORK UPDATE: The Thanksgiving edition of THURSDAY NIGHT FOOTBALL adjusted up to 7.4 in final numbers. However, what the NFL giveth, it taketh away, and with the football overrun removed, FOX’s CAUSE FOR PAWS lost 0.3. ELEMENTARY gained 0.1. The pickings were slim for original programming on cable Thanksgiving night. COLLEGE FOOTBALL on ESPN and Fox Sports 1 took up 2 of the top 5 slots at 0.78 and 0.34 respectively. Adult Swim fared best of the other networks, with NEWSREADERS up 0.02 to 0.61, and ERIC ANDRE SHOW steady at 0.50. 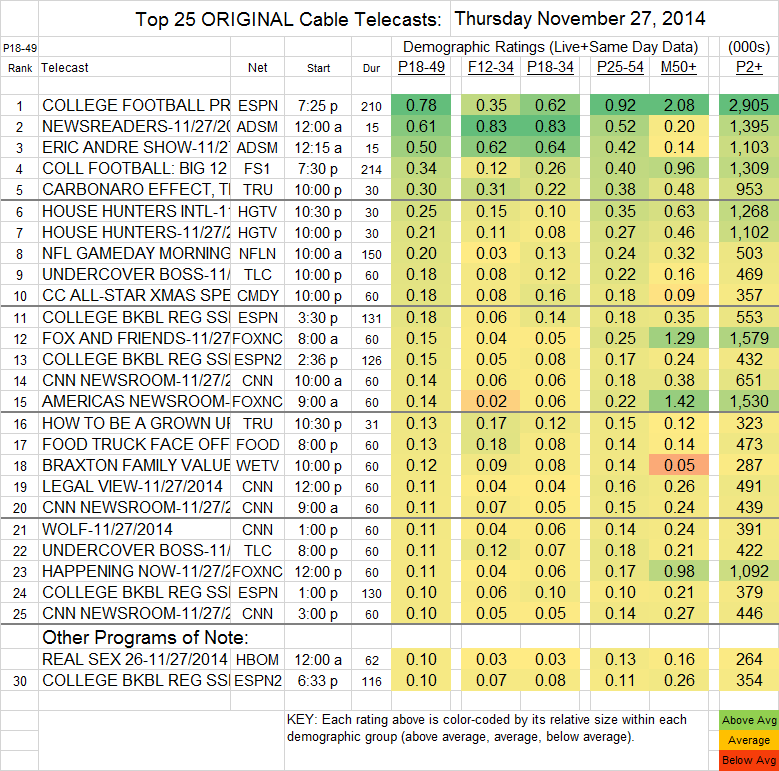 THE CARBONARO EFFECT (Tru) was the 5th biggest show of the night despite falling 0.03 to 0.30. On Comedy Central, the ALL-STAR XMAS SPECIAL was at 0.18.